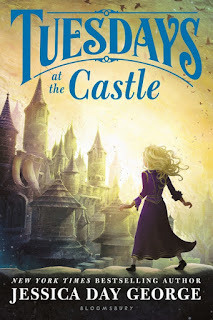 For MMGM, I am recommending Tuesdays at the Castle by Jessica Day George. See where it all began with Jessica Day George's magical bestselling series! Tuesdays at Castle Glower are Princess Celie's favorite days. That's because on Tuesdays the castle adds a new room, a turret, or sometimes even an entire wing. No one ever knows what the castle will do next, and no one-other than Celie, that is-takes the time to map out the new additions. But when King and Queen Glower are ambushed and their fate is unknown, it's up to Celie, with her secret knowledge of the castle's never-ending twists and turns, to protect their home and save their kingdom. I really enjoyed this book! One of my favorite things about it is how original its premise is. The author has taken what seem to be common elements of books, such as magic and royalty, and made a unique mash-up of them, helping to keep the plot interesting and unexpected. Of course, this is helped by the fact that the book moves quickly through many interesting events. Conspiracies are uncovered, people are trapped, and the castle's magic creates many fun twists and turns. Even as the plot rushes forward, however, the characters remain full of life and emotions, never becoming dull or caricatures of themselves. The main character, Celie, is especially likable, never becoming too much like an adult but still rising up in the face of a challenge. Although this book is part of a series, it doesn’t end on a cliffhanger, so you can read it as a standalone book (I felt that the second book in the series went too slowly, but people have enjoyed the later books, so it may be worth it to read the whole series). 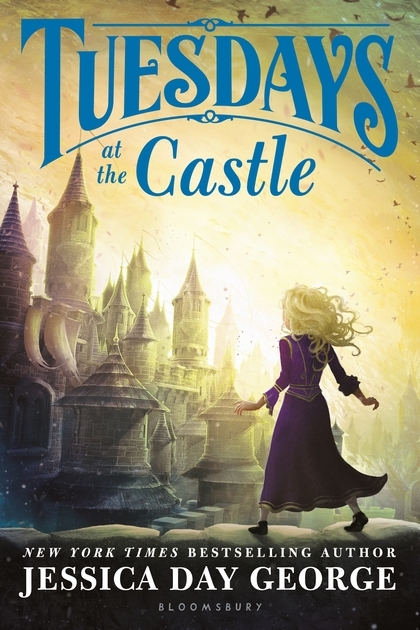 Whether you read it by itself or along with the rest of the series, Tuesdays at the Castle is a wonderfully fun book for readers of all ages! 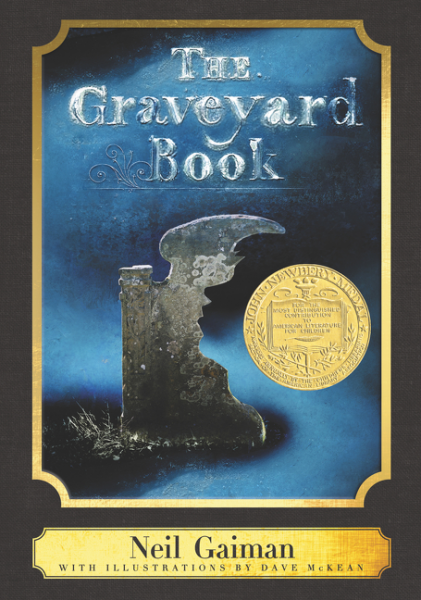 For MMGM, I am recommending The Graveyard Book by Neil Gaiman. I love this book! There are so many things I could talk about, but here are the major ones. Firstly, the characters are very well-rounded, with interesting backstories (some of which are initially mysteries to the reader) and personalities. Bod, even though he does make mistakes, is still a likable main character. Also, the writing of The Graveyard Book is great. It has its own personality (just like in another of Gaiman's books that I enjoyed, Coraline), making every part of the book interesting. There is enjoyable description which makes scenes vivid and often adds a sense of creepiness. Finally, the plot of the book is great. There are subplots, twists, and climactic scenes that keep the reader on the edge of their seat. All in all, The Graveyard Book is a fabulous novel that absolutely deserves both the Newbery Medal that it won and the love of readers everywhere! For MMGM, I am recommending Heartbeat by Sharon Creech. That's what twelve-year-old Annie loves to do. 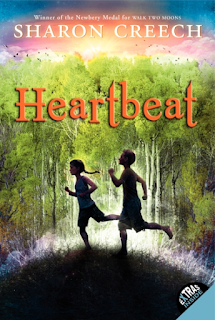 When she's barefoot and running, she can hear her heart beating . . . thump-Thump, thump-Thump. It's a rhythm that makes sense in a year when everything's shifting: Her mother is pregnant, her grandfather is forgetful, and her best friend, Max, is always moody. Everything changes over time, just like the apple Annie's been assigned to draw. But as she watches and listens, Annie begins to understand the many rhythms of life, and how she fits within them. I loved everything about this book! One of my favorite things about it was the writing. The main character, Annie, has a realistic voice which is both thoughtful and down-to-earth, and the writing is expressed in beautiful, rhythmic verse. Scenes are described vividly, as are the emotions contained within them (unsurprising, since Creech has written many amazing books, including Newbery Medal-winning Walk Two Moons). The book has a great plot as well, never dragging on as it jumps from one topic to another, dealing with aging, friendship, and new siblings, with added extras thrown in (such as running or drawing an apple). Heartbeat is not very long (only 180 pages of verse in large font), but each chapter is a touching moment. Everyone who is lucky enough to read this book will definitely enjoy it! I have no MMGM this week, since I have had no time to read or reread a book. However, to make up for it, I am recommending three poems for Poetry Sunday! The first is "The Panther" by Rainer Maria Rilke, the second is "After Apple-Picking" by Robert Frost, and the third is poem 449 ("I died for Beauty — but was scarce . . . " by Emily Dickinson. I hope you enjoy these!